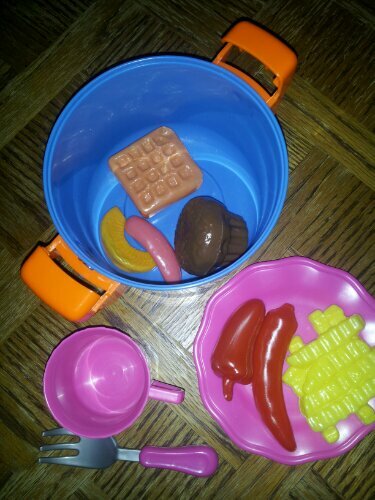 This is the lunch Nathan “cooked” me today in his play kitchen. It’s a stew consisting of a muffin, a waffle, a hotdog, and an orange slice. He also served me a plate of french fries, a red pepper, and I believe that’s a red chili, complete with a cup of milk. Well at least the milk will mitigate the heartburn! This will be quite an interesting meal for sure! I love that boy. This entry was posted by Jen on May 23, 2013 at 3:40 pm, and is filed under Daily Life. Follow any responses to this post through RSS 2.0.You can skip to the end and leave a response. Pinging is currently not allowed.